I always write at my dining room table looking out the bay window. I look out and there is the Yoshino Cherry tree – lovingly named Yoshi – planted last year as a gift from Maw-Maw. There is a slightly faded patio umbrella missing it’s cap, standing tall in the middle of a glass table with equally faded chairs to match. The tomato, peppers, and garlic stand tall and proud in their clay pots purchased from IKEA. The beautiful pink hanging basket purchased at the beginning of the outdoor season is beginning to reach it’s end in this hot Southern sun. The neighbors dog stretches strong, only to curl back up on the deck, while his brother is asleep on his doghouse (yes, I said on, not in). A lone hummingbird continually chases away other hummingbirds from our feeder filled with sweet water for them. One remaining corn stalk that grew from seed sways in the quiet breeze. The daylily blooms are long gone, but the stems remain – not quite ready to pluck out. In the back corner of the yard lies an awkward little garden. A dogwood tree that I recently shaped, flowerless peonies, and two bunches of a type of weed that I have come to find quite pretty – tall, long stalks of green featheriness. The bees fly in and out of the little pink flowers on the hanging basket, as the birds fly in for a quick bite at the thistle and sunflower seeds. It’s a nice view, a pleasant comforting view. Sometimes the view isn’t as good though unless you have someone to enjoy it with. This is where the mascot comes in. I want you to meet Cinder. Cinder has been my right-hand kitty for almost 10 years now. I adopted her from a veterinarian’s office after all the rest of her brothers and sisters had been adopted. She was the kitten that wanted to hide all of the time. I’ll never forget the first time I held her. You had to hold her really tight so she would feel safe. She eventually blossomed into the perfect sidekick. Since I have been doing this site, she always finds somewhere close by me to snuggle up while I type away. 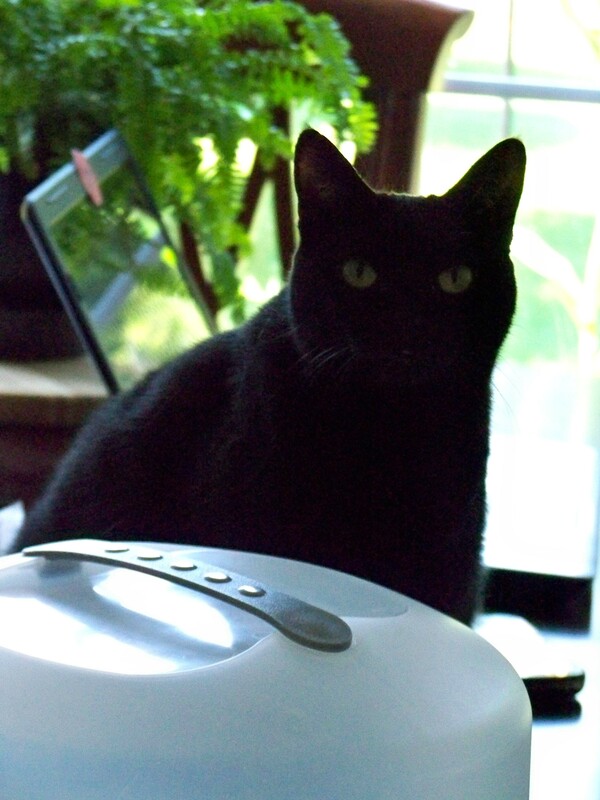 Most of the time, she is curled up right beside the laptop on the dining room table purring away – no worries people, I wipe down my table thoroughly before ever having guests over. While doing this, she tends to find time somehow to attack my fingers as they type away. We wrestle over the shift key and the letter “A” most times as my pinky flies towards them quite often. In fact, as I look now, I do have a couple scratches from the other day when she thought my pinky was a play toy. But, she is always by my side when writing, and I wouldn’t change a single scratch. Basking in the sun with me, waiting for my pinky to appear on the keyboard again. Cinder is your perfect little companion and mascot! It is just too bad she and Ducky never became friends. Oh well, they both love you – as I do! Love my Grandkitty too! I don’t think either of them wanted to share me. :) She loves you too! Awwwwwwwwww – Cinder is lovely. 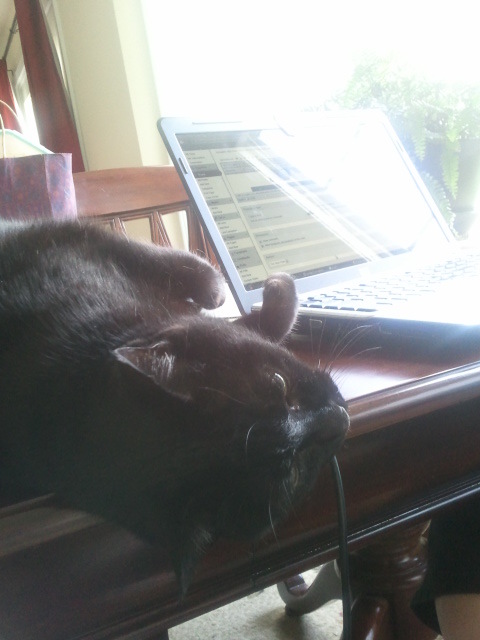 My Jack (a girl) lays in front of the keyboard so she can lean on my arm as I type.